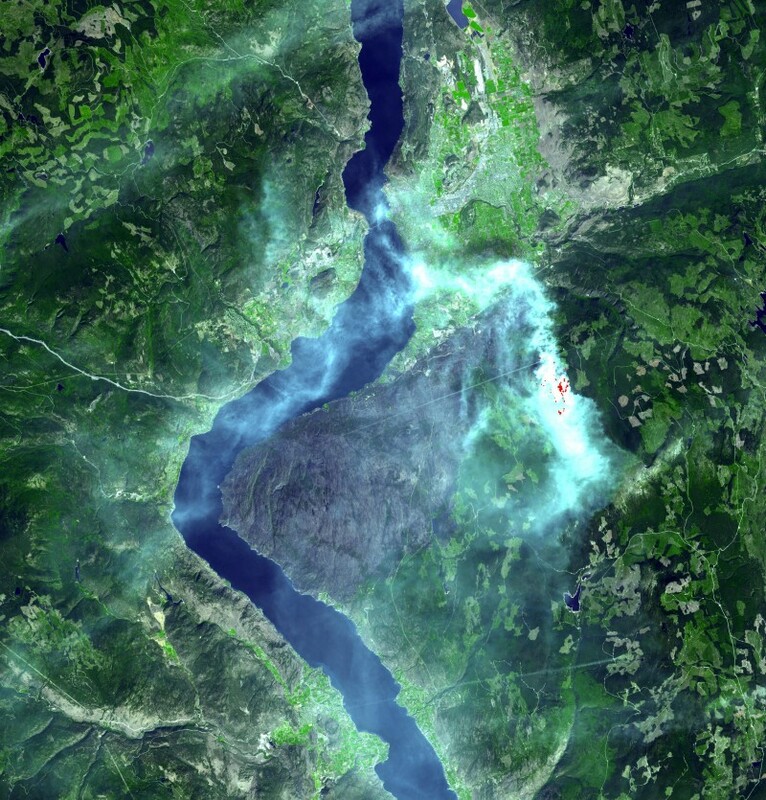 On August 16, 2003, a wildfire was started near Rattlesnake Island in Okanagan Mountain Provincial Park in British Columbia. The one-in-a-hundred-year inferno began with a lightning strike and was fuelled by a constant wind and one of the driest summers in a decade. The fire grew northward and eastward, initially threatening a small number of lakeshore homes, but quickly became an interface zone fire as it approached the city of Kelowna. An interface zone is an area where urban development occurs on or near lands that have a significant fire risk. Figure 8.12 Satellite image in natural colours of the fire location and the surrounding area. In white is the smoke from the fire, in red inside the white area are fire hotspots of intense heat. The fire eventually grew to cover over 250 square kilometres and forced the evacuation of 27,000 residents. The firestorm challenged personnel from over 60 fire departments across BC: over 1,000 forestry fire fighters, contractors and loggers as well as 1,400 members of the Canadian armed forces. Tourism and the local wine industry were heavily impacted by the fire. August is the peak tourist season in the Okanagan region and tourism numbers are estimated to have declined 30% to 50% below normal during the period of the fire. A popular tourist attraction for extreme mountain biking, the Crawford area trails were closed indefinitely. The Kelowna Crags, a rock-climbing area within the fire zone was compromised by the heat of the fires, and six marine campgrounds accessible only by boat on Okanagan Lake, were destroyed. The St. Hubertus Estate Winery, originally planted in 1928, was destroyed along with the the owner’s home and the entire 2003 crop. Although St. Hubertus was the only winery damaged by fire, many others in the region also lost their crop that year due to smoke taint. In the end, 239 buildings were destroyed. The fire also destroyed 12 historic wooden railway trestles and damaged two other steel trestles in the Myra Canyon. These trestles were part of the Myra Canyon Section of the Kettle Valley Railway, in use from 1914 to 1978, and were considered a historic engineering feat. The section was declared a national historic site of Canada in 2002. Figure 8.12 Satellite image in natural colours of the fire location and the surrounding area. 2003 Okanagan Mountain Park Fire (en.wikipedia.org/wiki/2003_Okanagan_Mountain_Park_Fire) by NASA/GSFC/METI/Japan Space Systems, and U.S./Japan ASTER Science Team (http://asterweb.jpl.nasa.gov/gallery-detail.asp?name=okanagan) is in the Public Domain. Case Study 3: 2003 Okanagan Mountain Park Fire by Geography Open Textbook Collective is licensed under a Creative Commons Attribution 4.0 International License, except where otherwise noted.